Okay okay I know. By the stroke of midnight I really meant by the stroke now. Typical me in the blogging world to over promise and under deliver but with my new position in the real world and less time to sit on my duff and drink beer while syncing flash animation advertisements to Flock of Seagulls (yes, I really do this), I have found that quality over quantity reviews win the day. I know that these reviews aren’t for everyone because, well let’s face it, beer isn’t everyone’s cup of tea. But I do hope to add a little something for everyone. After this review I will just tack on a review as a bonus to real articles going forward. We still have a way to go this season so lets jump in and pop the top of the first two brews. Don’t tell me you forgot the bottle opener! The HEX Ourtoberfest from Magic Hat Brewing Co. located in Burlington, VT is one of the first beers that I nearly broke my neck taking a double-take while walking past the beer aisle last week. It has one of the greatest looks, art and names of any spooky-time beer that I have seen since…ever, really. It screams colonial creeps with the iron gate logo and the name “Hex” font-ed in thorny branches. But like Bugs Bunny taught us, just because it looks hot doesn’t mean what’s under the dress isn’t a rabbit with nuts. How does it perform? It definitely has the autumn hue that an American made October brew tends to have. The taste, however, is very different. Right from the first taste you get less a hoppy/spice taste and more of a tart/smokey flavor. It was an awesome surprise especially after thirty pumpkin spice beers to have a roundhouse kick to the palate to clean it of pie and paint it with smoked molasses. I never thought I would say “smoked molasses” in a positive way. The Magic Hat Brewery states that it has a blend of fermented apples, caramel and smoked cherry wood malt that gives it the different taste. I will say this about Hex and that is if you are looking for a very different blend that will keep you interested in seasonal beers, this is your homecoming date. It’s a smokey sweet lighter beer that makes you want to chop wood. The strange part is that this beer is only available until October 15th. 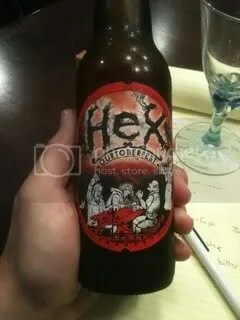 I am not really sure why they made such an early date in the season to pull Hex but if you have the means and you can find it, I highly recommend buying this and maybe extras to keep in the cellar. I give it three singing Elvises. 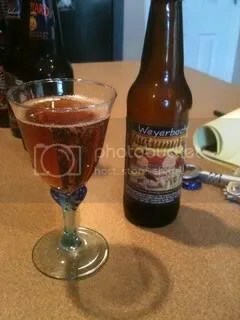 Hello Weyerbacher Autumn Fest Brew, how are you? I love the name Weyerbacher. I assume it’s German because I keep wanting to pronounce it “Vierbocker” in a very WWII German officer accent. “Vee have vays to make you talk.” Anyway, this is a great full body brew from Easton PA that doesn’t really break away from the fray when it comes to another American Oktoberfest type beer. 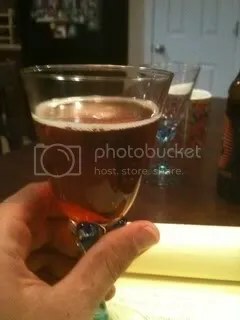 Same copper color and mildly sweet malty taste. What I love about this beer, of course, is the awesome farm-scape scene with the creepy scarecrow and harvest moon-lit yellow sky. I really wish I could line the walls of the house with prints of all these beers but perhaps my life shouldn’t imitate art. It’s already a satirical cartoon. I give it two flying toasters. 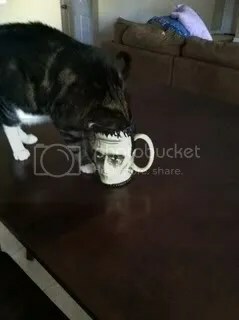 A couple of nights ago while reviewing these beers I decided that putting catnip in the bottom of a Frankenstein’s monster mug would make for a good title page shot. I forgot how fat the cat is and when he got his head stuck, Frank’s monster was the loser. Had to bury him in the backyard. 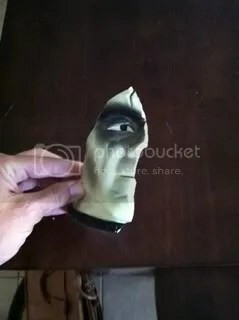 Broke my heart all over again to see what became of that poor, beautiful mug, Will-Bill. But I’m intrigued by the Singing Elvises scale of ratings. I’m wondering how Elvis factors in to other scales, if three Singing Elvises is worth as much as or more than two Toilet Jumpsuit Elvises, or four Slim Black Turtleneck, Still Can Stand on His Toes Elvises. To be honest, I stole the singing Elvis standard from an episode of Arrested Development. Best! Line! Ever! Seriously! That was creative genius my friend! I’m going out this weekend and buying some Fall beers in your honor and getting blitz…err doing a review! YES! That is awesome Dan. Mind if I boast your review on here? Not at all! Heck I’d be honored! Last weekend, I went out and had a beer because you inspired me to do so. And like I said before, I hate beer. But, I’m bound and determined to find one I like, and these fall beers sound like the way to go. I’d like a pumpkin flavored one if possible. That is, if I can find one around here. I’m mesmerized by that Flock of Seagulls…thing. I don’t know what the hell that was about, but I like it. I know that. The Flock of Seagulls thing was sheer boredom. I saw the cutest ad on Matt’s site for Petmeds. Soooo…I just iPhone videoed it with music in the background. Seemed to make sense at the time. Go to the mega Wine store in major cities. They have great beer selections.